Hi all, this is a follow up post from my previous entry about how to use the jBPM Console. The main idea of this post is to describe some of the most common configurations that you will required to do to the jBPM Console NG in order to use it in your own company. But before going into technical details we will be covering the differences between the KIE Workbench (KIE-WB) and the jBPM Console NG itself. Both applications require similar configurations and its good to understand when to pick one or the other. We will be covering these topics in the free workshops in London. If you look at the project source code and documentation, you will notice that there are several projects that are being created to provide a complete set of tools for Drools and jBPM. Because of the modular approach that we have adopted for building the tools, you can basically choose between different distributions depending on your needs. The jBPM Console NG can be considered as a distribution of a set of packaged related with BPM only. The KIE Workbench (KIE-WB) is the full distribution, that contains all the components that we are creating, so inside it you will find all the BPM and Rules modules. If more modules are added to the platform, the KIE-WB will contain them. Sometime ago Michael Anstis posted an article in blog.athico.com to explain this transition: http://blog.athico.com/2013/06/goodbye-guvnor-hello-drools-workbench.html This blog post was targeted to Guvnor users, so they can understand the transition between Drools 5.5 and Drools 6. So the intention behind the following section is to explain the same but for jBPM users, trying to unify all the concepts together. Uberfire and Guvnor are both frameworks, not distributions. We are keeping the name Guvnor for what it was originally intended. Guvnor is a framework to define all the internal project automation and organization. Guvnor is the internal framework that we will use to provide a smart layer to define how projects and all the knowledge assets will be managed and maintained. KIE-WB-Common is not a distribution by itself but it could, because it contains all the shared bits between all the distributions. Drools Workbench only contains authoring tools related with Rules, notice that in the same way as Guvnor it doesn’t provide a runtime for your rules. This could be added in the future but in 6.0 is not. The difference between names (Drools Workbench and jBPM Console NG) is due the fact that the jBPM Console NG does provide all the runtime mechanisms to actually run your Business Processes and all the assets associated with them. Notice that the jBPM Console NG uses some of the Drools-WB modules and also integrates with the jBPM Designer and the Form Modeller. 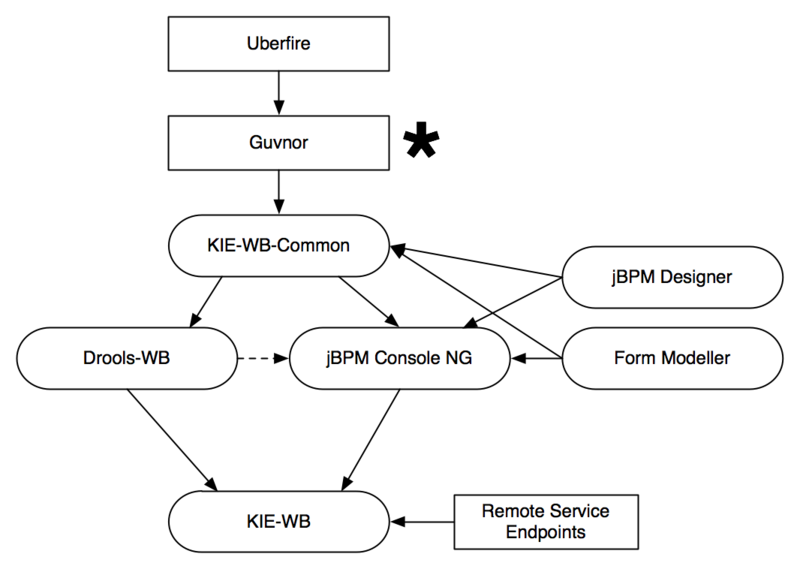 KIE Workbench contains all the components inside the platform and also add the Remote Services to interact with processes. Notice that the Remote Service in 6.x are only for the BPM side, that means that we can also provide the jBPM Console NG distribution with those services, it is not a priority right now but it can be done if someone thinks that it’s a good idea. The jBPM 6.0 installer will come with KIE Workbench bundled and because of this most of my posts will be showing screenshots of KIE-WB instead of the jBPM Console NG. Here we will see how to deploy and configure the application to work in JBoss AS 7. Obviously you don’t need to do so if the jBPM Installer does that for you. But is always good to know what is going on under the hood, just in case that you prefer to manually install the applications. By default the KIE-Workbench uses the JBoss AS configured users to work. In order to create a new user we need to use the ./add-user.sh script located inside the /bin/ directory. Using this script we will be creating all the users required by our business processes, and for that reason we will be also assigning them groups and roles. As you can see in the previous image, using the ./add-user.sh script you can create a new user for the Application User (first two options: option B, and empty realm). Note that you need to use different strings for the user name and for the password. For now you can create users with role admin, so it will have access to all the screens of the tool and then you can write the groups where the user belongs. In this case the user salaboy has Role: admin and he belongs to the IT group. There are some restricted words that cannot be used as group names. For now avoid using “analyst”, “admin”, “developer” for group names. Domain Specific Connectors are the way to integrate your business processes with external services that can be inside or outside your company. These connectors are considered technical assets and because of that needs to be handled by technical users. Most of the time it is recommended to not change/modify the connectors when the application is running, and for that reason these connectors needs to be provided for the application to use in runtime. Provide an implementation of the WorkItemHandler interface, which is the one that will be executed in runtime. In order to provide these three configuration points you can take a look at the Customer Relationship example in the jbpm-playground repository. The main idea here is to have a separate project that contains the workItems implementations, for example: CreateCustomerWorkItemHandler , you will need to compile this project with maven and install the produced jar file inside the KIE-WB application. In order to do that you just copy the customer-services-workitems-1.0-SNAPSHOT.jar into the WEB-INF/lib directory of the kie-wb.war app. On this example the workItemHandler implementations interacts with a public web service that you can check here , so you will require internet connection in order to try this example. You can download a pre installed version of KIE-WB where you can clone the jbpm-playground repository which contains the example (Authoring -> Administration and then Clone a Repository using the jbpm-playground url: https://github.com/droolsjbpm/jbpm-playground). This pre installed version contains the workItemHandlers already installed and configured for the Customer Relationship example, but you can obviously make some changes and upgrade them if it’s needed. Please feel to try it out and let me know if it works for you. There are some few seats available for the Drools & jBPM Free Workshop Tomorrow and on Thursday. If you are planning to assist please write me an email to salaboy (at) redhat (dot) com. For more details about it look here. First issue that I’ve noticed with the provided zip file is that if you download and uncompress the zip file inside a path that contains spaces, not matter if you are in Linux, Windows or Mac you will experience issues after logging in the application. So please copy the application to a path that doesn’t contains spaces. So if your applications are not deploying add the extra attribute: deployment-timeout="1200"
I am getting a loading icon, which disappears after a short time . Can you please help. Which Operating System are you using? Let me guess Wndows?? Which browser are you using? Can you try Firefox or Chrome? [22:14:25.025] Error in parsing value for ‘filter’. Declaration dropped. @ http://localhost:8080/kie-wb/org.kie.workbench.KIEWebapp/KIEWebapp.html? By the way.. which JDK are you using? Those are some CSS issues reported by your browser, are those giving you issues? Anything obvious I have not done! Do not add the -server-config=standalone option, because that;s just in case that you want to install the application in a new JBoss application server, but this was already configured. Notice that I’ve added a couple of well known issues, so check for that as well. Can I ask some queries about changing/broken functionality in jBPM 6.0? (1) The asset download button disappears in CR5 if I use an LDAP-based login (I had to change the config. from admin to kie-admin, etc. ), but works in CR2 with LDAP (where kie-user is configured by default – I have both roles kie-admin and kie-user). I’m guessing there is another configuration I am failing to change from admin to kie-admin? Or maybe it is hardwired in code? (2) The REST task query service works in CR2 but doesn’t seem to work properly in CR5 (specifically, ?potentialOwner=… returns an empty list even if the console shows there are available tasks). This last one is really a pain, because we switched from CR2 to CR5 for the improved GUI behaviour, but most of my code for talking to the REST service now no longer works. Are these task service problems getting fixed? Soon? 2) We are aware of those issues in the task services (only using the REST apis) and those issues were already fixed. We are about to make the final announcements for the 6.0.0.Final so I strongly recommend you to go ahead with that version and report any issues that you may find. I promise faster response times here in my blog. I’m cerrently trying to install the KIE workbench. Have you any idea about this error, or any other site that can help me to install KIE Workbench?. It sounds like you have a corrupted file that you are trying to deploy. Can you make sure that you download the full file? Can you check the size of the file? which the size is 6,40 MB. I succeed to resolve the problem. The problem is -as you say- the file is corrupted. I redownload it, and it is OK. Thanks for the support! I would love to be able to post more frequently, there is a lot of stuff going on with the projects, so I need some help to spread the word! Are you currently working with jBPM / Drools? Do you have a blog or something like that? Yeah, that will be awesome, I would recommend start writing some very basic tutorial with your findings until now and we can move forward from there. From a JS project. It either times out or gives an Invalid username/password error. Today it mysteriously worked and I could not tell what I did differently. Now it is back to its old tricks, not working. Please help. Hi George, what are you trying to achieve with that? That will never work. If it worked once it was because you used the form at least once and it stored the cookie for that user. This part of the request: j_security_check?username=admin&j_password=admin doesn’t make any sense to me.. imagine that if we allow to do that you can grab the password because it is not encrypted. Thanks. The cookies part makes sense. I am using the XMLHttpRequest(). What is then the bast way to send an authenticated request to the service (with encrypted creds). You will need to find a way in JS to do a preemptive authorisation mechanism or a form based login as it shown in the previous links. I you get it working and you want to share it please let me know. I’m interested in having a JS client for jBPM, that sounds a great community contribution. It works as below but with a clear text credentials as above. Do you know of the digest accepted by the authentication server so that I can encrypt and try to include the credentials in the request header? all you need to do tom implement preemptive authorization is add a request header where you set the Authorization to Basic and pass along username:password base64 encoded. I have also realized that when accessing the Client JS app from Chrome, authentication works only if Chrome is started with disabled security (at-least on Ubuntu). I am not sure if there is a workaround on this as one wouldn’t want use Chrome on insecure mode. I’m very new in the drools community and I need some help to understand something.I’ve done a rule using KIE-WB 6.1. I’ve done the test case to check that everything is correct. Now, I would like to invoke this rule using Rest API from another web application.The problem is that I don’t know how to do that.Is there any Rest service? So please give me the suggestions. Did you get some answer from the Drools mailing list right? Let me know if you still have questions, but looking at the mailing list it seems that you have some directions to follow now. Thanks for the reply @salaboy. But I didn’t found the exact procedure how to made it. Please suggest me some ideas for the above scenario.And I saw your London workshop video, that’s a great video for the new users to drools. And one more thing I would like to ask you one more thing regarding to the 6.2 beta(CR1 wildfly distribution), in that distribution after successful installation I was not able to see the “servers, process-management” menus in the menu bar.I have deployed the KIE-WB distribution along with the drools execution server. Please help me for these things.And for this question also I didn’t found exact solution. I deploy and run this project on kie-wb (jbpm 6.3). 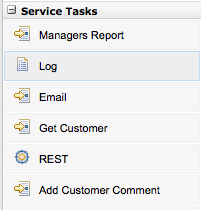 after “build and deploy” , service tasks like “add customer comment” disappear from process model ! Not sure about what is happening. Can you create a Jira in jira.jboss.org? You will need to provide the exact steps to reproduce the issue there. It might be a case that a configuration is breaking your process. But if you didn’t modify the process model it should work as expected.